I hope you enjoy this sneak preview from Knitty Gritty - Knitting for the Absolute Beginner. As this is the first of my free patterns, I thought I'd give you something special. 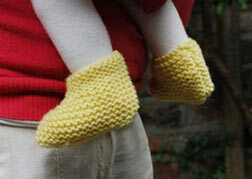 As a taster of my new book, here's Project Two: Baby booties. This pattern's ideal as a second project, so if you've already knitted a scarf, here's the ideal step up.